These dice are crafted from solid bar stock made from Teflon® PTFE resins, which makes these some of the slickest dice around. Teflon can be found in a myriad of modern applications, including chemical resistant containers, high temp industrial applications, racing components, surgical grafts, and NASA even sends this stuff in to space. But it’s probably best known for keeping your fried eggs from sticking to the bottom of the pan. This is due to Teflon’s ultra low coefficient of friction (just 0.04!). That low COF gives these dice a unique feel in your hand. Standard plastic dice roll and bounce all over the table, as well as make that distinctive dice tumbling sound all of us gamers know so well. 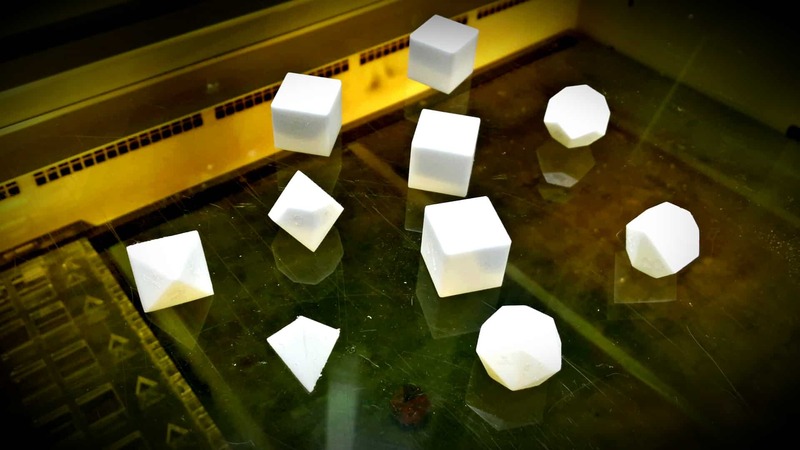 Teflon on the other hand, has none of the bouncy noise making properties of the Acetyl based thermoplastics used in the injection molding of typical mass produced gaming dice. This is due in large part to Teflon’s durometer, which is half that of Acetyl based plastics. (65 for Teflon, 120 – 140 for Acetyl) This does not mean Teflon is soft. Far from it. 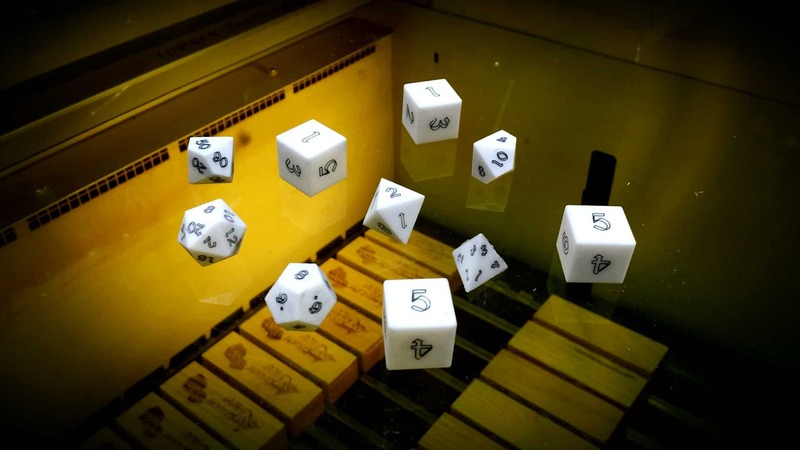 Instead the lower durometer allows the Teflon dice to absorb the impact of the roll, thus dampening both the sound and the bouncing action we typically associate with dice. In the video below you can see as well as hear the difference between our machined Teflon dice and a typical injection molded d20. As with all of our polyhedral dice, the numbers will be laser engraved. Since there is no color change on Teflon, this means the number by default, are incredibly hard to read, so we fill the dice with a carbon black acrylic inlay. PLEASE NOTE: We no longer make puzzle cut acrylic boxes, all of our dice sets are shipped in a round box made from eastern aromatic cedar. What’s the cost on a poly set (filled)? These would probably be great for playing just about any game with kids, easy to clean off and out away, kids are always covered in something. I know I was. 🙂 great idea, folks, love your work! You mean hydrophobic, not hydroscopic, right? Hydroscopic means it can absorb water. I just got a d20 of these and it might be my favorite now. The reduced tumble is noticeable but not radically so I don’t think (compared to acrylic, dyed buckeye burl and water buffalo horn which is what I have). I’m looking forward to rolling this and the new second wind d20 at the same time – then I’m sure the difference will be night and day! The heft is great (about twice as heavy as the acrylic) and it just feels great to roll. If you like a heavier feel this is perfect. Also, the painted numbers look absolutely fantastic! These dice are super easy to read, have a wonderful feel, and look amazing. My favorite set so far.